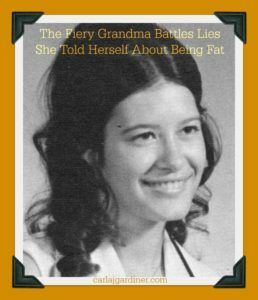 The Fiery Grandma battles the lies she told herself about being fat. Come on, admit it; you’ve lied to yourself in the past, too! Every woman over 50 has told her younger self a lie in some form. Maybe your hair was too thin, too thick, too curly, too straight; maybe you were too thin, too fat, too big-boned, too short or too tall. Am I right? Today, I was reminded of the lie I have told myself my whole life, that I am too fat. Let me start at the beginning. This is my senior high school picture. If only it could talk. The memories it brings back are many, some happy, some not so much. One memory that burns bright about this time in my life is how I felt about myself. I sure was NOT The Fiery Grandma, I thought I was fat! I went to T.O.P.S. meetings with my mom, got on the scale every week to measure my success or failure. Talk about programming! They say hindsight is 20/20 and I agree. First of all, I was NOT fat, compared to who? Second of all, I was programming my mind and body to struggle with weight my entire life. Last but not least, by focusing on how I looked I missed out on enjoying my senior year. I didn’t go places, wasn’t involved in clubs or groups at school because I didn’t feel like I fit in…With what or who? I don’t know about you, but high school was a difficult time socially for me. I attended a small country school and our graduating class was small, just 12 kids and only 4 of those were girls. Entering a large high school, our class of about 1,200 was the scariest thing ever for me, I was invisible. Changing classrooms for each subject was strange to us, we sat at one desk, in one room with one teacher all day long. Those changes took time to make and adjust to. I remember one day at break time eating a snack feeling so alone. Sure there were kids all over the place, but no one dressed like I did, combed their hair like I did. Many of the popular girls had the latest fad clothes, shoes and binders. I came from a humble working family of seven; those things just weren’t in the family budget not even on the radar. I’m not so sure I wanted those things; but, I can tell you I wanted friends to talk to, visit with and get to know. Most of the girls were slender, had beautiful hair, wore makeup and had nicely manicured nails. Me? I was the most Plain Jane you’ve ever seen; no makeup, I bit my nails, my hands were rough and my clothes were the best my family could afford. I just wanted to fit in, to be like others. Have you ever wondered why we are like we are as adults? Have you ever felt like you were destined to fail before you ever began when it came to losing weight? I’ve discovered that my mindset was formed from a very young age, just look at the picture above. Do you see a fat girl there? Looking back at this picture I don’t see a fat girl, not even close. But, the mind plays dirty tricks on us. Isn’t it time we change our thoughts and tell it a different story? Right now is the toughest time of year to start anything new. However, right now…this very moment is the time to make a decision to change that little voice inside of you that says don’t start you’ll only fail again. Click this link to get your free sample, then join me, The Fiery Grandma as we re-write the story of our weight loss together. Carla Gardiner is a mom of 2, the fiery grandma of 7 and has been married to her husband for 38 years. She is focused, and driven; a business owner who made a big move in her late 50’s which rocked her world. Transitioning from her native hometown to her new home 3 states away took guts, work, and dedication to get the job done. Now, she is focused on helping other women over 50 make choices necessary to improve their lifestyle; one they’ve been dreaming of instead of the nightmare it could become.